I’m so grateful for your interest in my books and my writing. Check out my latest releases on the BOOKSHELF page, and click through to Amazon.com to place an order, either print or digital. Each book—even those in a series--stands alone so the stories can be read in any order. 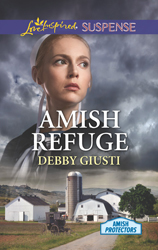 To read my journey to publication, click on the ABOUT DEBBY page. A list of events I attend each year can be found in the APPEARANCES section. Be sure to download a copy of THE WRITER’S PRAYER while you’re browsing my site. My motto is FAITH WITH AN EDGE . . . CROSS MY HEART! It represents the promise I make to readers that every book I write will have a Christian message, as well as both a tender love story and spine-chilling suspense. I love to hear from my readers. Leave a message on my guest book or email me at debby@debbygiusti.com. If you like to blog, visit Seekerville at www.seekerville.blogspot.com, voted one of the top 101 blogs for writers in 2013, 2014, 2015 and 2016 by Writer’s Digest. We’re a group of 13 Christian authors who provide insight into publishing and the writing life, with daily book giveaways and prizes. I post on the third Wednesday of every month. You’ll also find me, along with other Love Inspired Suspense, Love Inspired, and Love Inspired Historical authors, at www.craftieladiesofromance.blogspot.com and www.loveinspiredauthors.blogspot.com. Visit my personal blog at www.crossmyheartprayergroup.blogspot.com. I love to hear from my readers. Write me c/o Love Inspired, 195 Broadway, 24th Floor, New York, New York 10007. Each day, I pray for my readers. Hope you feel the prayers!